I heard a rumor that parrots were rife in Petersham and the surrounding areas. Turns out the rumor was true. Spotted a load of them today in Richmond Park. I was told they had a member’s bar on the go, so I went down to investigate. Which was also the moment I decided to observe them from elsewhere. 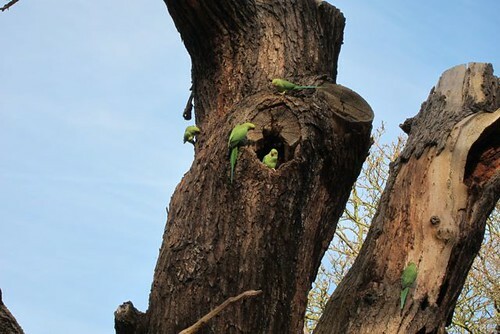 Indian Ringneck Parrots (also called parakeets). January 16, 2012 at 12:39 am. Permalink. It’s amazing that they adapted to live there! January 16, 2012 at 8:26 pm. Permalink. This reminds me of the wild monk parakeets that live in Chicago’s Hyde Park neighborhood. I suppose these guys were once pets, or offspring of former pets. January 17, 2012 at 12:13 am. Permalink. The Zen Parrot: Cheers for that. Have you met these guys? Lun-Sei & Bicoid Babe: They are indeed bred from former pets. Rumor over here is it was a couple who flew off from a Zoo. Clearly didn’t hang about for long coz there are thousands of them now! January 17, 2012 at 8:27 am. Permalink. 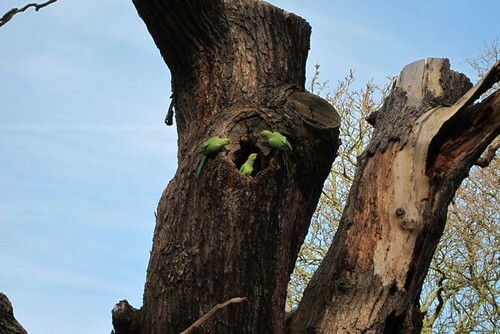 I regularly see these parakeets in Regent’s Park – they seem to have a favourite tree. Watching them is like a flash of the Indian sub-continent in my own back garden. March 12, 2012 at 2:13 pm. Permalink. parrots are nice pets indoors, i always keep them inside our house..
January 20, 2013 at 6:02 pm. Permalink. September 13, 2015 at 11:02 am. Permalink.